This entry was posted in Easter, Other and tagged Cream egg cover, crochet cream egg, egg cozy. Bookmark the permalink. Your patterns and work are amazing! Could you give instruction on the duck feet, or at least a close up picture? Thanks for sharing the patterns. They are wonderful. I was wondering if it is fine to make a few of these and sell at a local Easter fair? They look so cute.,can’t wait to try and make them, awesome idea. how do you make these without using the magic ring? So sweet 😁 thank you for sharing you’re lovely patterns for free. I really appreciate your hard work. Can’t choose which one to make first! I am making some for a charity and in sure they will be snapped up. Thank you so much so posting the rest of your wonderful pattern it is absolutely the best I’ve seen. And thank you for sharing it. I hope everyone finds the rest like I did. I would also love to get the rest of this pattern. They are absolutely beautiful. My kids would love to wake up to these on Easter Morning spread all over my kitchen table as a scenery. I hope you will soon put on the pattern for the finishes. how do you make these without using the magic ring!! I so would love the finished pattern to these beautiful egg covers . Yes Yes Yes Please would love to know how to finish your easter egg covers! What a fantastic idea for an Easter Egg hunt…using the covered eggs….what a treat for the kids. I even thought what about making a certain color one to get an extra surprise? Can hardly wait for the rest of the pattern. Thank you for sharing! You only posted the bodies of the covers. 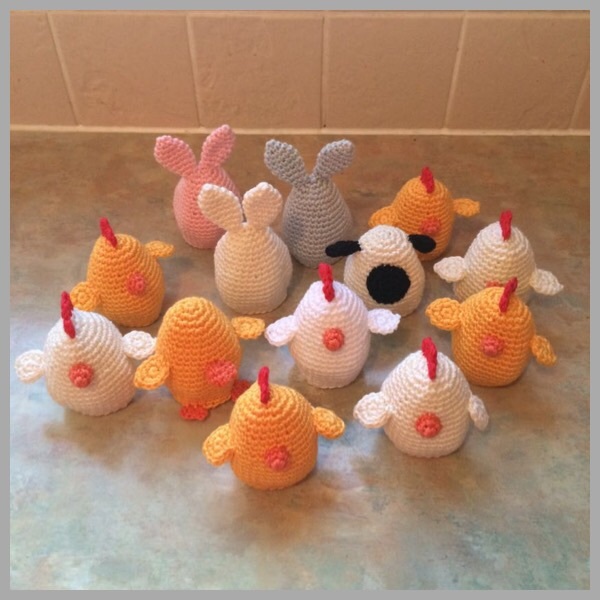 Do you have a pattern for the bunny ears, chicken and duck wings, beaks, chicken comb and the ears for the sheep? I really like these and want to make them for my grandkids. You find the rest here: scroll down..I can see the rest. The chickens red comb on top of the head isn’t therebut I think it’s a simple chain tied on securely.